Areas allocated for industrial logging and community-owned forests account for over 50% of all remaining tropical forests. Landscape-scale conservation strategies that include these forests are expected to have substantial benefits for biodiversity, especially for large mammals and birds that require extensive habitat but that are susceptible to extirpation due to synergies between logging and hunting. Additionally, the response of large vertebrates to logging alone are poorly understood due to their cryptic behaviour and low densities. In this study, we assessed the effects of logging and hunting on detection and occupancy rates of large vertebrates in a multiple-use forest on the Guiana Shield. Our study site was certified as being responsibly managed for timber production and indigenous communities are legally guaranteed use-rights to the forest. We coupled camera trap data for wildlife detection with a spatially-explicit dataset on indigenous hunting. Our multi-species occupancy model found a weak positive effect of logging on occupancy and detection rates, whilst hunting had a weak negative effect. Model predictions of species richness were also higher in logged forest sites compared to unlogged forest sites. 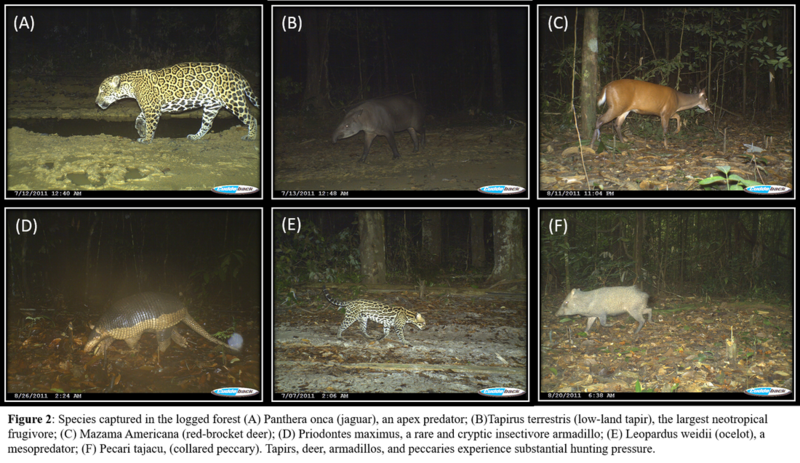 Density estimates for jaguars and ocelots in our multiple-use forest were also similar to estimates reported for fully protected areas. Involvement of local communities in forest management, control of forest access, and nesting production forests in a landscape that includes strict protected areas seemed important for these positive biodiversity outcomes. The maintenance of vertebrate species bodes well for both biodiversity and the humans that depend on multiple-use forests.